قنبری, سجاد, حفیظی, محمدکاظم. (1392). بررسی اثر بسامد مرکزی آنتن‌ و کاربرد پارامترهای پردازشی در مکان‌یابی تاسیسات شهری مدفون به روش GPR. 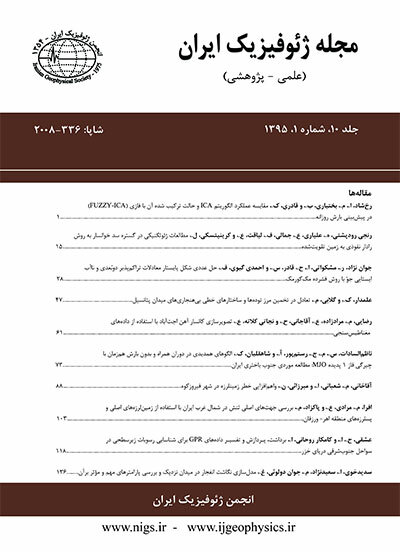 مجله ژئوفیزیک ایران, 7(3), 93-106. سجاد قنبری; محمدکاظم حفیظی. "بررسی اثر بسامد مرکزی آنتن‌ و کاربرد پارامترهای پردازشی در مکان‌یابی تاسیسات شهری مدفون به روش GPR". مجله ژئوفیزیک ایران, 7, 3, 1392, 93-106. قنبری, سجاد, حفیظی, محمدکاظم. (1392). 'بررسی اثر بسامد مرکزی آنتن‌ و کاربرد پارامترهای پردازشی در مکان‌یابی تاسیسات شهری مدفون به روش GPR', مجله ژئوفیزیک ایران, 7(3), pp. 93-106. قنبری, سجاد, حفیظی, محمدکاظم. بررسی اثر بسامد مرکزی آنتن‌ و کاربرد پارامترهای پردازشی در مکان‌یابی تاسیسات شهری مدفون به روش GPR. مجله ژئوفیزیک ایران, 1392; 7(3): 93-106. به‌‌منظور ارزیابی روش GPRدرحکم روشی غیر مخرب و سریع برای مکان‌یابی تاسیسات زیرسطحی، یک بررسی عملی در تونل نیایش تهران صورت پذیرفت. برای به‌‌دست آمدن نتایج مناسب، هم‌زمان از چند آنتن به‌منزلة روش سخت‌افزاری و به کارگیری الگوریتم پردازشی درحکم روش نرم‌افزاری استفاده شد. آنتن‌های به کار گرفته شده، دارای بسامد‌های 100، 250 و 500 مگاهرتز هستند. در رادارگرام‌های به‌‌دست آمده، به‌سختی نشانه‌‌هایی از اهداف مورد ‌‌نظر دیده می‌شد. ازین‌‌رو با استفاده از روندهای پردازشی مربوط به هر آنتن، کیفیت مقاطع تا حد مطلوبی افزایش یافت. رادارگرام آنتن 250 مگاهرتز کارایی و کیفیت بالاتری داشتند، به‌‌گونه‌ای که بسیاری از تاسیسات در این مقطع به‌‌خوبی پدیدار شدند. تحلیل سرعت به روش هذلولی پراش بوده است. با وجود اینکه در مورد تعیین نوع لوله‌ها و کابل‌های مدفون در تحقیقات ژئورادار هنوز باید بررسی‌های بسیاری صورت بپذیرد، اما در این تحقیق با توجه به شرایط خاص تاسیسات، تلاش‌هایی برای تعیین نوع بی‌هنجاری و تفسیر کامل رادارگرام انجام شده است. درنهایت نتایج به‌‌دست آمده از پردازش و تفسیر داده‌های رادار در مقایسه با واقعیت زمین پس از حفاری، بسیار رضایت‌بخش بوده‌است و می‌توان از مزایای روش ژئورادار در تحقیقات عمرانی مشابه بهره گرفت. Creating new routes for underground cables or intubation, keeping the subsurface utilities and protecting them during the excavation and building requires a thorough knowledge of the exact location of subsurface utilities. Overall good results in GPR closely depends on some factors such as soil type, anomaly properties, survey design and proper selection of antenna. Finally, applying the appropriate processing parameters in accordance with the conditions, soil type and anomaly properties will be out of control and therefore, two other factors i.e. survey design and application of advanced processing parameters will be more important. In survey design, the selection of survey methods such as CMP, 1D or 2D and the appropriate antenna are the main factors influencing the necessary resolution. GPR processing must be performed according to the specific conditions of each study. Since applying appropriate processing parameters can be useful, improper handling can be misleading. In order to locate buried water pipes and telecommunication cables, a GPR survey was applied to Niayesh Tunnel in Tehran. In primary sections, the pipes were not visible appropriately. The most important factor in hardware methods is choosing the correct antenna according to the site conditions and the studied depth. Appropriate processing methods are used in GPR sections as software in order to increase the signal-to-noise ratio for locating the target.According to this issue, we used central frequency shielded antennas (500 MHz, 250 MHz and 100 MHz). Then an advanced processing algorithm including several filters and recorrection parameters was applied. The velocity analysis was done according to the diffractionhyperbola method. In this study, it was attempted to determine the type of the buried anomalies and utilities. However, more research is needed to determine the pipe type of the buried utilities in a GPR survey. Finally, the results of the processing and interpretation of radar data were compared to the real conditions of underground properties. This research will be useful for future GPR work in similar civil excavation projects. Booth, A. D., Endres, A. L., Murray, T., 2009, Spectral bandwidth enhancement of GPR profiling data using multiple-frequency compositing; Journal of Applied Geophysics, 67, 88–97. Alain Denis, A., Frédéric Huneau, A., Stéphane Hoerlé, B., and Andrew Salomon, B., 2009, GPR data processing for fractures and flakes detection in sandstone, Journal of Applied Geophysics, 68, 282–288. Novais, A., Costa, J., Schleicher, J., 2008, GPR velocity determination by image-wave remigration: Journal of Applied Geophysics, 65, 65–72. Bano, M., Pivot, F., and Marthelot, J., 1999, Modelling and filtering of surface scattering in ground-penetrating radar waves: First Break, 17(6), 215–222. Conyers, B. L., 2004, Ground Penetrating Radar for Archaeology: Altamira Press, 16-21. Daniels, D., J., 2004, Ground Penetrating Radar: the Institution of Electrical Engineers Press. Davis, J. L, and Annan, A. P., 1989, Ground-penetrating radar for high resolution mapping of soil and rock stratigraphy: Geophysical Prospecting, 3, 531-551. Deparis, J., Fricout, B., Jongmans, D., Villemin, T., Effendiantz, T., and Mathy, A., 2008, Combined use of geophysical methods and remote techniques for characterizing the fracture network of a potentially unstable cliff site the “Roche du midi,” Vercors massif, France: Journal of Geophysics and Engineering, 5, 147–157. Endres, A. L., Booth, A. D., and Murray, T., 2004, Multi-frequency compositing of spatially coincident GPR datasets: Proceedings of the 10th International Conference on Ground Penetrating Radar , June 21-24, 2004, Delft, The Netherlands, 271–274. Gamba, P., and Lossani, S., 2000, Neural detection of pipe signatures in ground penetrating radar images: IEEE Transactions on Geosciences and Remote Sensing, 38(2), 790-797. Grasmueck, M., Weger, R., and Horstmeyer, H., 2006, Full-resolution 3D GPR imaging: Geophysics, 70(1), K12–K19. Khaidukov, V., Landa, E., and Moser, J., 2004, Diffraction imaging by focusing-defocusing: an outlook on seismic superresolution: Geophysics, 69(6), 1478–1490. Linford, N., 2006, The application of geophysical methods to archaeological prospection: Reports on Progress in Physics, 69, 2205–2257. Neal, A., 2004, Ground Penetrating Radar and Its Use in Sedimentology: principles, problems and progress: Earth-science reviews, 66, 261-330. Van der Kruk, J., and Slob, E. C., 2000, The influence of the soil on reflections from above surface objects in GPR data: Proceedings Eight international conference on Ground-Penetrating Radar, Queensland, Australia, May 23–26, 453–457. Westerdahl, H. R., Austvik, R., and Kong, F. N., 1992, Georadar in tunneling the tunnel radar. Geological Survey of Finland: Special Paper, 16, 41–45.